Marilyn Arnold Palley at Kent Gallery. Once again, Key West artist Marilyn Arnold Palley breaks new creative ground exploring the raw harmony between the mineral and the organic, between nature and evolution, between spirit and flesh. Building on her nearly three decades of acclaim as a fibre and woven sculptural artist Palley's most recent innovations are one of kind sculptural necklaces worked to perfection with earth elements and semi-precious stones like amber, jade and turquoise, as well as metals such as silver, pewter and vermeil. Always an innovator in tactile and ancient mediums, Palley's talent for creating powerful decorative and functional works of art continue to feed her intellect and senses. The wearable results, which can be seen from February 9 to March 4 in her new solo show at Kent Gallery, are elegant, strong, and a visual testament to Palley's versatility. It would be a misnomer to call these unique sculptural neckpieces, designed for both women and men, jewelry. Palley is as thoughtful in transcending the known as she is in redefining the hidden and mysterious. Combining different stones and metals in a single piece the artist's deep connection to her materials produces a revealing expression of texture, form and color that is natural, ancient, and equally personal. Palley's energy is as alive in the final piece as the ninety million year old shards of history she shapes together. Her necklaces are contemporary totems with their crystallized technology, broken stones, and biblical glass. Whatever inherent properties these millennia-old materials contain it is Palley's aesthetic, rooted in simplicity and beauty, which seduces. Touching and wearing one of her sculptures is the first note of a musical and mythical incantation. Palley finds these earth elements in her travels throughout the world, handpicking each piece with an eye toward shape and color. Her eighteen year journey circumnavigating the globe aboard the sailboat Unlikely, with husband and author Reese Palley, speaks to the romance in her work and life. She admits her attachment to the aura of past generations and ancient cultures and she is committed to preserving what she calls the state of perfect imperfection in the chunks of coral, tiger eye, bakelite, onyx, and jasper she collects. There are even places her materials come from, like the recent delivery of black amber from Indonesia, that bring with them a taste of the forbidden as worldwide access to such elements is rare in our 21st century community. Most of all, there is an undeniable connection to time, memory and genetics in each necklace and like all strains of DNA no two pieces are alike. Palley never repeats herself and the sheer volume and diversity in this body of work alone makes the experience profound. Palley believes adornment for the human body should be unique, natural and comfortable. She achieves this critical balance and more, literally re-educating the wearer's very sense of the body as a work of sculptural art itself. "Conversation happens when you wear a Palley neck sculpture," says Palley collector Erin Stacey from Los Angeles. "Its definitely not bling." "People can't get enough of Marilyn's work," says Claire Kent of Kent Gallery. "We see collectors of Marilyn's necklace sculptures returning for their sixth or seventh piece excitedly seeking out a different feeling or adornment for different days and phases in their lives. I've become deeply connected myself and love wearing a new one as often as I can. They are so beautiful and so distinctive. I keep mine hanging out on display in my home. Now, I'm hinting around for another one for Valentine's Day." "Even my husband," Kent continues, "wears one when we go out for a special evening and he was the last person I envisioned with something like this. But one day Marilyn put a very small and simple one around his neck, adjusted the height at which the piece hung and you could see this calm and balance wash over him. It's a very casual-chic thing with him now and he says it makes him feel a bit like royalty every time he puts it on." Marilyn Arnold Palley's totems, sculpture and jewels have been represented full-time at Kent Gallery since 2005. Recently she has added solo shows of her totems at prestigious galleries in Philadelphia, Martha's Vineyard and Sarasota. Later this year, Palley will have the honor of being the first American to ever show her work at the Danish National Museum of Arts and Design. Palley's wearable sculptures average $235-$450. A few of her rarer pieces on display at Kent Gallery sell upwards in the thousands. On Friday, February 9, 2007, from 6-9 pm., Kent Gallery is hosting a reception for the artist. Kent Gallery is located at 821 Duval Street, Key West. They are currently open daily, 10-7. They can be reached at 305-292-5646 or by visiting kentgalleryart.com. 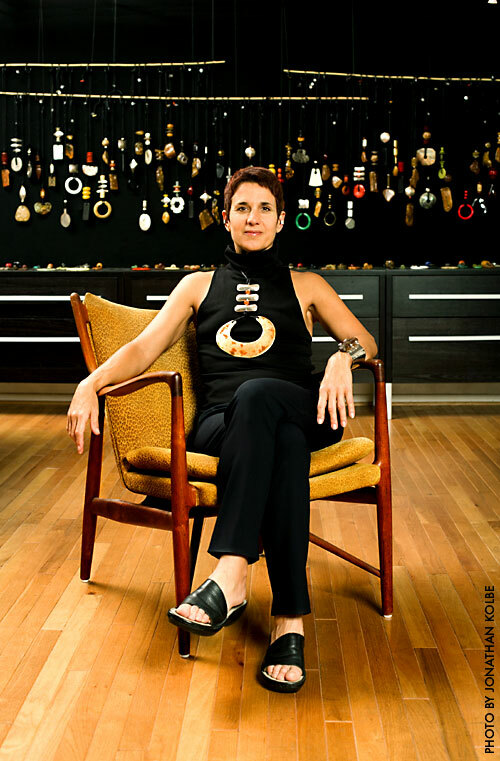 Call us clairvoyant: Thirty years ago, we anointed Camden-born and Philadelphia-raised Marilyn Arnold Palley one of "76 People to Watch in '76"; today, we're still watching her-particulary when she's wearing one of her signature totems, the architechtonic "wearable sculptures" she makes out of everything from Baltic amber to centuries-old jade to Bakelite and ebony. She's been collecting her materials for decades, during travel and sailing trips around the world with her author-husband Reese Palley, a former gallery owner who first showcased her work. Even clients who traditionally wear daintier pieces can't help but stand taller when they try one on," she says. They also can't stop touching. "My work has always been about that tactile experience, how things feel and how people interact with them," she explains. And we're not the only ones with our eyes on her. She has a show at the prestigious Wexler Gallery this fall, and another next spring at the world-renowned Danish Museum of Arts & Design-the first ever by a non-Dane. Our Philly Mag crystal ball tells us we'll be seeing more of her, so it's no surprise that when asked which of her hundreds of pieces she favors, Palley answers, as Frank Lloyd Wright did when asked the same question of his buildings, "The next one." -J.B. Pieces from $180 to $5,000; marilynarnoldpalley.com. Palley has traveled with her husband around the world in their own boat and has accumulated large numbers of stones and other materials - antique jade from China, black amber from Indonesia, silver from Scotland, soapstone from Swaziland - that she recently began structuring into the totems and now offers to the public. She sees each stone as a part of a vocabulary that she orders into a coherent statement, which involves color, texture, and shape. So each piece is a harmony of the various elements she brings together. The effectiveness of a piece is not in the value of the material but in the integration of these parts into a vibrant whole. Palley prefers to do pieces that have leather strips around the neck (length can be adjusted) and that end in three or four kinds of stones and culminate in the touchstone. This kind of structuring looks natural for both men and women to wear. Her other work has stones around the entire leather strap; this resembles other necklaces and seems appropriate primarily for women. For this kind of sculpture, Palley places the more decorative stones on the left or right side of the piece rather than in the middle, say three turquoise pieces among a band of silver. This produces a rhythm of materials quite distinct from typical jewelry. The variety of materials and the variations of design can be illustrated by brief descriptions of three of the totems. In one, an oval of Baltic amber is followed by several discs of onyx. The touchstone is a natural piece of Madagascar amber about four inches long, whose twisted shape reflects light from several directions. Another is a series of discs of onyx followed by larger discs of reddish amber; another series of onyx discs culminates in a large half circle of jade with flakes of celadon and rose. A third is a necklace with 18 ovals of African amber. On one side are two small rectangles of burnished silver, between which is a rather large oval of hammered sterling. In each of Palley's totems are pieces that reflect light bringing "the light up to the face." Palley was trained at the Philadelphia College of Textiles and Science; she has spent most of her professional life as a weaver. For many years she focused on white on white textiles for ornamental pillows and fabricas and also created quite dazzling wall sculptures. Such work clearly trained her hand and eye in texture and composition and the relation of color to both of these. She first exhibited her totems at the Harrison Gallery (she is one among many artists to be recognized and presented to the public by Helen Harrison). Her success in this new medium is testified to by the upcoming October exhibit of her wearable sculpture at the Danish Musuem of Arts and Crafts. She is the first American to be so honored. The Kent Gallery will exhibit about 200 of her sculptures until March 4. An artist's reception will be held today, Feb. 16, from 6 to 9 p.m.
You will not be disappointed with these unique works of art.